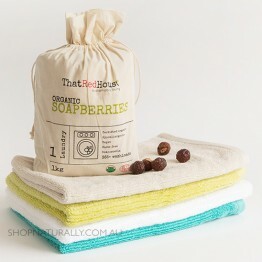 An eco friendly laundry detergent alternative is created from simple organic soap berries (also called soap nuts). With no plastic bottles or liquids to ship around, it's a cost effective way to ship natural laundry detergent around the country. A 1kg bag will do you in excess of 365 loads of laundry at just 11 cents per load. 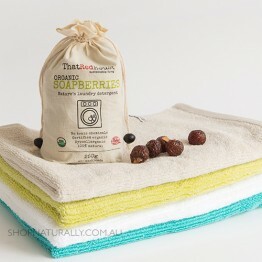 Use the berries on their own, or add your favourite essential oils for a scented wash. Woolen dryer balls cut drying time in half and reduce the need for fabric softener and ironing for many clothes.